The Fourth of July is an activity packed holiday, from the typical summer barbeque to the after dark fireworks display. Of course, the temptation is too great for many celebrators and many neighbors hear the blast of small scale fireworks off and on all week. Fireworks have the aura of magic about them, but are bit like the magic of the Sorcerer’s Apprentice. When the unprepared or immature set off fireworks, they could let the magic get out of control, which gets them, or others, burned. It is important to remember that fireworks are explosives in every sense of the word. Fireworks are made of a shell with a fuse that contains explosive material. 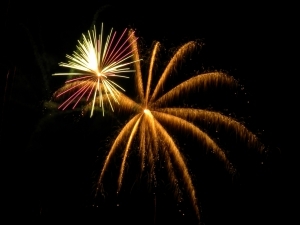 Smaller fireworks may consist of paper or cardboard wrapped tightly around black powder. Urban cities such as San Francisco, Oakland, and San Mateo have banned the sale and use of fireworks all together by non-professionals. Close quarters ramp up the hazard for fires and injury and make it a matter of public policy to crack down on violators. Other Northern California cities like Dublin, Union City, Sacramento, and St. Helena allow residents to set of so-called safe and sane fireworks. Safe and sane fireworks include sparklers and spinners and are characterized by the fact that they do not fly or explode. Illegal fireworks, for example the notorious M80, are responsible for many holiday related injuries because they are more powerful and more unpredictable than safe and sane fireworks. Illegal fireworks are unregulated and therefore do not undergo quality control. Illegal fireworks have been known to explode prematurely while still in the amateur pyrotechnician’s hands. In general, fireworks should be handled very carefully at a safe distance away from spectators and especially children. If you are having your own show, never relight a dud firework as it has already proven to be unpredictable and could explode without warning. Carefully place used fireworks in a bucket of water to prevent unwanted explosions. Of course, it is never advisable to handle fireworks under the influence of alcohol as it severely impairs judgment. Sparklers may seem like the most innocuous of fireworks, but actually the slow burning wands can reach temperatures of 1800 degrees Fahrenheit. Children are more susceptible to burns and eye injuries from fireworks and sparklers are a big culprit. The American Pyrotechnics Association released a chart showing fireworks related injuries from 1974-2006. Unfortunately, the number of injuries each year has stayed fairly constant, fluctuating between 8,000 and 12,000 injuries every year. In 2006, 9200 injuries were reported. The good news is that although the base numbers have not declined much, the number of injuries per pound of fireworks consumed by Americans has actually decreased drastically. In other words, there are a lot more fireworks being shot off on Fourth of July, but no more injuries than in past years. The Brod Law Firm wishes you a safe and happy Fourth of July! We take personal injury cases of all kinds. Call us today for a free consultation.